It is fitting that the word nostalgia is derived from Greek. It encompasses a yearning for the past, a Greek compound of the meanings “returning home” and ” pain” or ” ache.” I turned my own nostalgia- missing my friends, today in particular one of my closest friends who is Greek and inspired this- into the tangible: my version of a Greek salad. I felt much better after I ate it. Parsley or cilantro make a great substitute for romaine, or God forbid, iceberg lettuce. 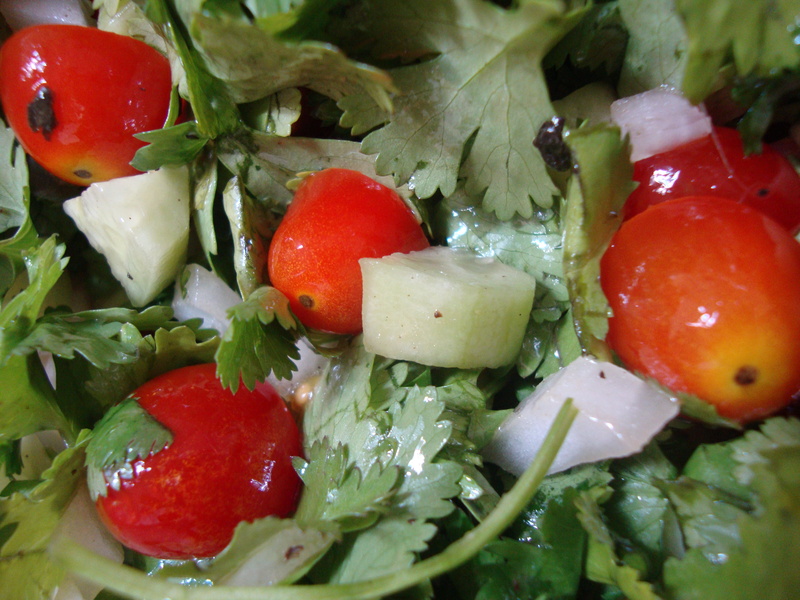 The subtly spicy leaves add a lingering kick to this delicate and refreshing salad. Adding sea salt, a little habit I picked up in Spain, mildly enhances the flavor of tomatoes. Tear leaves off of one thick bunch of parsley or cilantro, leaving no stems in the salad. Combine remaining ingredients and toss in olive oil and lemon. Add salt and pepper to taste. aw miss you too!!! and i know nikos does too!